With another four weeks of excavations at the High Pastures site remaining for the 2008 fieldwork season, I have posted below some of the finds recovered during the past couple of months. Although not as numerous as in previous years, we have had some great finds and more items have been recovered during the past week. Images of these finds will be posted before the end of fieldwork in September. The images above and below show a fragment of a finely-worked cannel coal or shale bracelet, one of several now recovered from the site, along with waste material from their manufacture. Although the material has laminated, the object is in remarkably good condition. The original cross-section of the bracelet would have been triangular with a tapering profile towards possible open terminals. 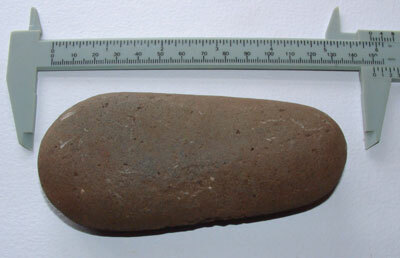 It was recovered from the forecourt area of the site, adjacent to the hearth settings immediately outside the cave entrance - prior to the construction of the stairwell. 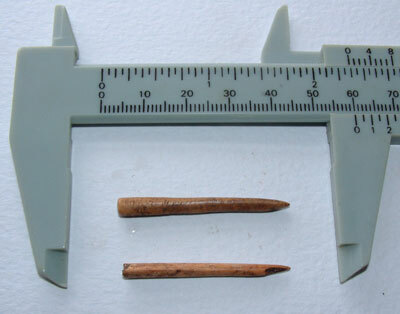 Although much fewer in number this year, we have recovered two needle or bone pin fragments from Trench 15, also near to the hearth settings mentioned above. 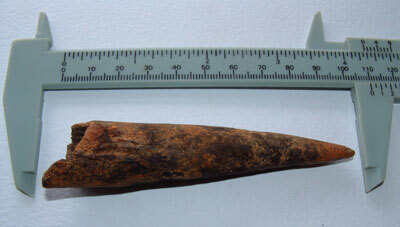 Another object, this time manufactured from the tine off a red deer antler, is possibly some form of handle or armature. The tine has been hollowed out inside. We have also recovered four additional spindle whorls from the area around the hearth settings in Trench 15. The image below shows one of the whorls, manufactured from a sandy-limestone type of material. 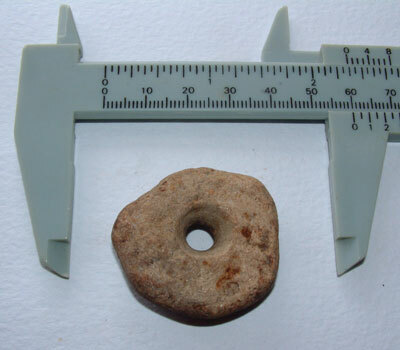 This is only the second spindle whorl to be found on site manufactured from a material other than soapstone (steatite). 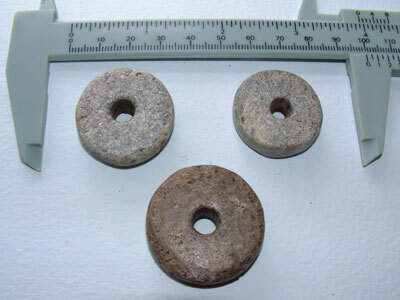 The other three spindle whorls recovered from Trench 15 are manufactured from soapstone, possibly from a Mainland source close to Glenelg or Auchtertyre. 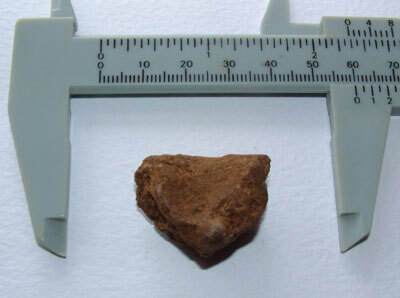 This is the most common type of item, with the exception of bone needles and pins, to be deposited in this area of the site and in the adjacent cave entrance (see image below). 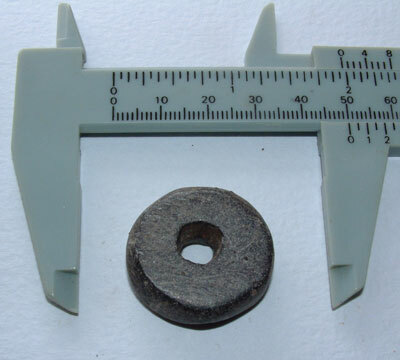 Another soapstone spindle whorl has also been recovered from Trench 19 (burnt mound), in a context overlying feature F19.03 - an organic-rich layer of material rich in burnt bone and charcoal. 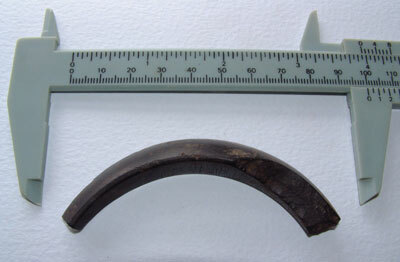 The whorl is in fine condition and the original working marks can be seen on the surface of the object. 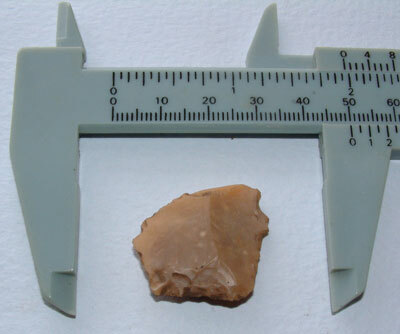 And, this flint flake with edge retouch, which is possibly of Late Neolithic or Early Bronze Age date (see image below). 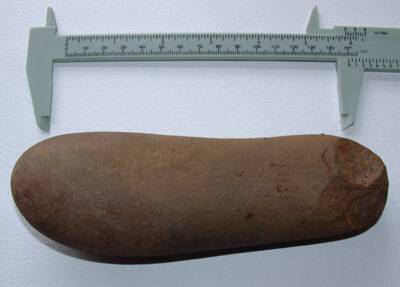 This pebble chopper tool (see image below), both of which were found on a working surface adjacent to one of the hearth settings in Trench 15. 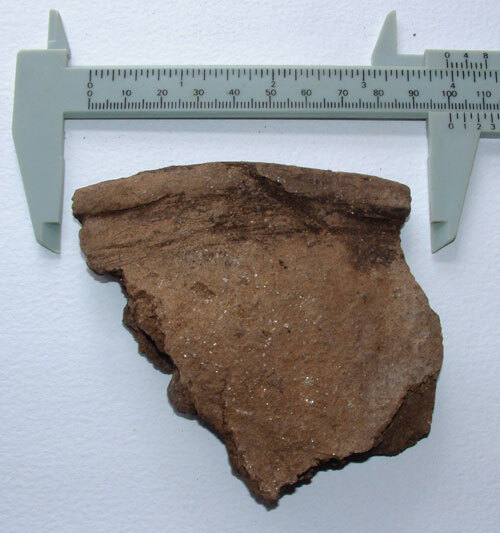 One particularly interesting sherd of pottery was recovered from Trench 19, at the interface where the burnt mound overlies a possible old ground surface. 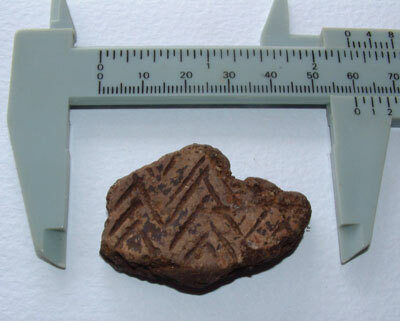 The pottery sherd is a little abraded and worn, but the decoration appears to resemble that used on All Over Cord Beaker, from the Early Bronze Age (see image below). Two similar re-fitting sherds of decorated pottery have also been recovered from a deposit of water-washed gravels in Trench 17 (Bone Passage - in the cave). Over the past couple of weeks, excavation of these sediments has produced some of the most interesting pottery recovered from the site. In some cases, the pottery sherds appear to have been stacked together, while other sherds appear as more isolated finds in the deposit. Most of the pottery is ‘fresh’ and unabraded, suggesting quick burial if these deposits had been affected by water action. 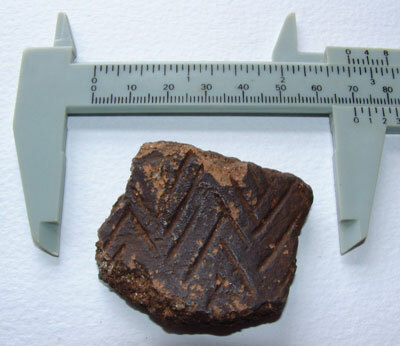 The decorated pottery sherds shown above and below are well-fired, while their decorative patterning appears to resemble Neolithic or Early Bronze Age ware, rather than Iron Age. 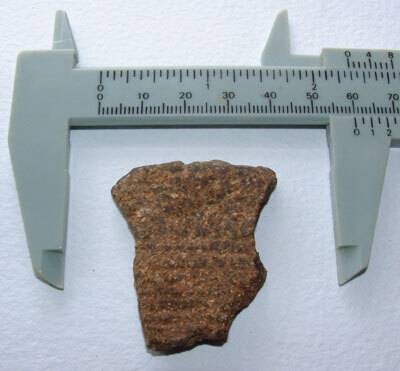 The image below shows just one sherd from a large undecorated pot, which were found stacked together in the water-washed sediments. Some of these refit together, while the rolled rim is quite distinctive. Some of the pottery sherds recovered from these deposits in the cave are some of the largest we have found during our excavations on site. They appear to represent a mixed assemblage, from differing periods of time, which requires some clarification and interpretation. Over the past week, additional sherds of pottery have been found in this context, some large and some decorated, and it will be interesting to see what time periods they represent. Hi Steve and all - wonderful to see the images of this season’s assemblage (or at least part of it, I guess). Exciting to see the many parallels between these and the finds from Applecross Broch. 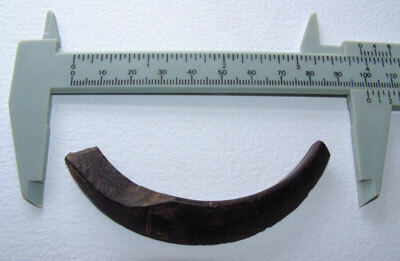 Our worked antler bits and pieces include some ‘toggles’, hollowed out rings - any of these turning up for you? Fraser Hunter, on seeing a picture of our bangle fragment has commented that there are known to be naturally occuring lignite deposits on Skye. Ours, when extrapolated to completion, gives an internal diam of 8cm, so quite petite. It would be good to get together over finds, etc at some point. I’m currently cataloging and photographing, but will be bringing all over to Applecross soon. Perhaps it might be possible to meet up. Wonderful website - wonderful project; continue to be inspired by all you do. 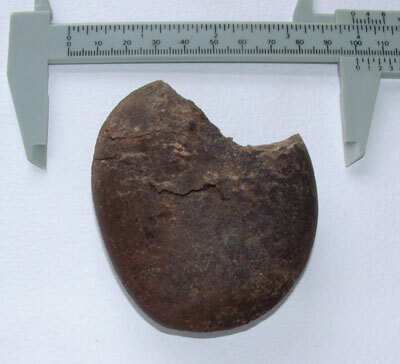 While hand trowelling on site at Mellor yesterday 22nd August, I found a piece of shale roughly circular, that looked as if worked - like a thick coaster! Underneath it is another piece the same size and shape. Do you have photographs of your shale pieces for comparison?